 ESD Continuous Monitor | Bennett and Bennett, Inc.
Screw the eyelet on the end of the mat ground’s cord into the mat monitor screw terminal to connect a mat. 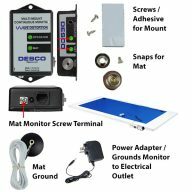 By default, the mat monitor switch is turned on. 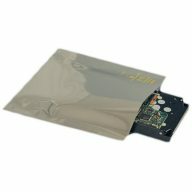 A. Mat Monitor Switch: Use a probe to access the mini slide switch. Slide the switch to the right to enable the mat monitor circuit. Slide the switch to the left to disable the mat monitor circuit. This switch is enabled as default. B. Buzzer Volume Adjustment: Turn the trimpot clockwise to increase the buzzer volume. Turn the trimpot counter-clockwise to decrease the buzzer volume. C. Monitored Operator Jack: Insert the single-wire wrist cord here to monitor the operator’s connection to ground. D. Operator LEDs: Illuminates green when the operator is properly grounded. 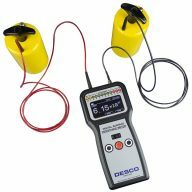 Illuminates solid red and audible alarm sounds when the operator is not properly grounded. 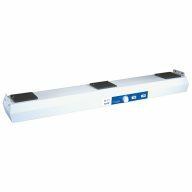 E. Mat LEDs: Illuminates green when the worksurface is properly grounded. Illuminates red and audible alarm sounds when the worksurface is not properly grounded. F. Park Snap: Allows the operator to disconnect (and park) a wrist strap when leaving the workstation, without creating a false alarm. Touch the park snap and the monitor’s audible alarm will disable for approximately 10 seconds. Use this time to disconnect the coil cord from the wrist strap, and attach it to the park snap or remove the coil cord from the monitor. 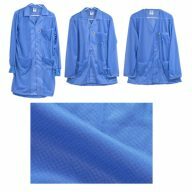 Upon returning to the workstation and disconnecting the coil cord from the park snap, the operator has approximately 10 seconds to reconnect the coil cord to the wrist strap before activating the alarm. G. Mat Monitor Screw Terminal: Verifies that the worksurface’s path-to-ground is <10 megohms. Connect the white mat monitor cord here. H. Power Jack: Connect the included 24VDC power adapter here. I. Remote Alarm Jack: Connects to the 19653 Remote Alarm accessory. Alarm System. The Multi-Mount Continuous Monitor monitors the path-to-ground for the presence of 1 meg ohm resistance of an operator’s wrist strap. Audio and visual alarms activate (in less than 50 milliseconds) when the operator unintentionally disconnects from the monitor or the wrist strap connection points are intermittent. Wave Distortion Technology. 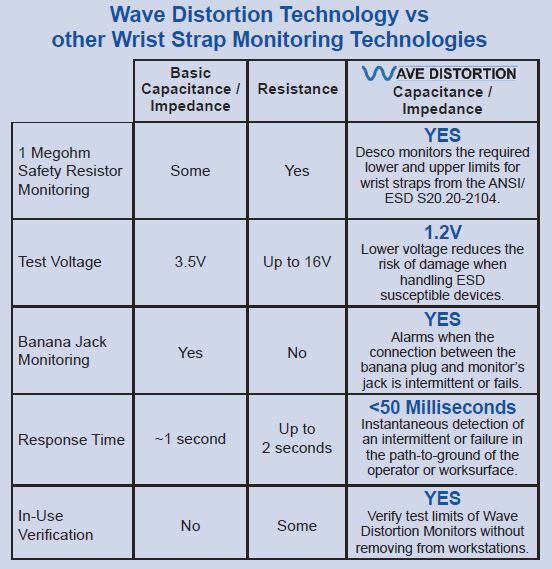 Wave Distortion Technology is the most reliable technology for continuous monitoring of single-wire ESD Wrist Straps. 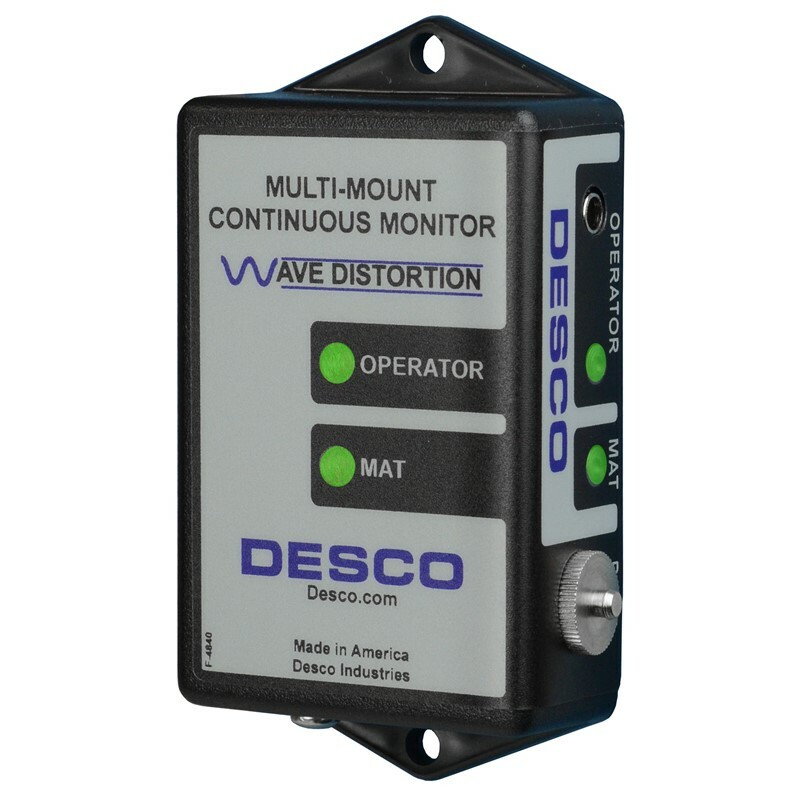 “Wave Distortion” or vector impedance works by applying a continuous test voltage of 1.2 volts peak-to-peak at 1 to 2 microamperes (0.000002 amperes) to the wrist strap that is connected to the continuous or constant monitor. The test voltage creates a sine wave that the monitor circuit compares to established patterns. By monitoring the “distortions”, or shape of the sine wave, Wave Distortion Technology determines if the monitored circuit is complete – the operator is in the circuit and the total equivalent DC resistance is within specifications. 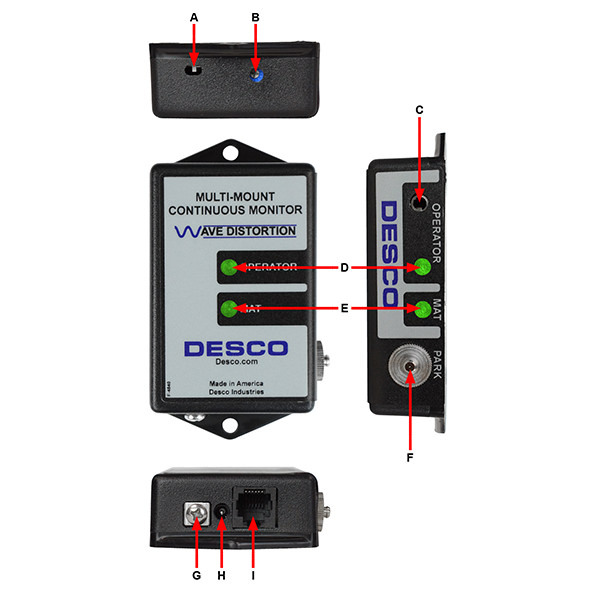 Wave Distortion Technology produces a very fast alarm time (<50 milliseconds) and minimal false alarms.